We offer a complete range of services, which we can customize to suit each individual client and situation. One of our Care Coordinators will schedule an initial consultation with you. Then we'll carefully develop a unique Client Care Service Plan. Once both the Care Coordinator and the client (or authorized family member) have agreed upon and signed this plan, our Caregivers will use it as a guide as they assist clients with daily living activities. We Are Family Home Care's policy is to re-evaluate the Client Care Service Plan at least every 4 months, in order to address any changes in the client’s situation. If warranted, we may re-evaluate it more frequently, if we've determined that a client's needs have changed. We welcome and solicit input from our clients and their families in order to provide the best possible service. 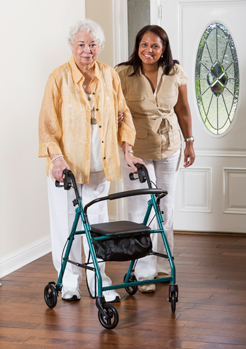 Our Caregivers can provide hourly services, 24-hour continual care, or live-in services. Perhaps your loved one doesn't currently need consistent caregiver services, but you just want someone to check in periodically? With our check-in service, one of our Caregivers or staff will stop by your loved one’s home just to see how things are going. * Check-ins can be scheduled a maximum of once per week. ** Please note that additional check-in service requests that are more typical of our companion/homemaker or attendant/personal care services or that require more than 30 minutes will be subject to 2½ hour minimum hours of service per visit. Payment for services can be made via personal check, eft/ach, credit card, or PayPal.